Kashima coat is a strong and durable, friction reducing surface coating that is used on high end Fox Racing Shocks and Forks. This is a stem cap. Although a stem cap has no reason to be Kashima coated, here it is. 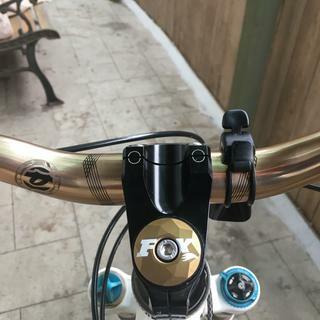 The ultimate upgrade to show some FOX brand love. 100% bling. No real use what so ever. But if it matches your bike and what something special this is for you. Different and unique also matching with my Fox 36 Factory KASHIMA COAT , love it . Needed a solid top cap... My cane creek cap, which is plastic, crushed which being installed - like to make sure this is tight to prevent any slop between the steer tube and the head tube. This fit the bill and looks nice. For those who care... The kashima gold is the lighter color not the darker gold. Looks nice on my trek remedy. Fits great, looks great! 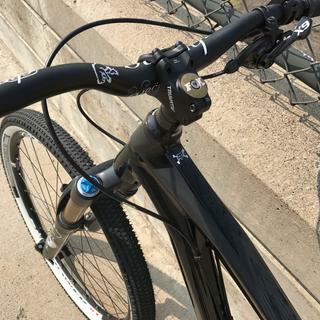 The kashima matches the factory fork perfectly! Well let me tell you something here... This, this fox top cap, it ain't no ordinary fox top cap Okay. THIS, this is full factory baby. This will NOT fit bikes that don't have genuine kashima shock and forks, and will not fit your bike if it has anything sram on it. (make sure nobody steals it) - because that's not factory. Great cap! Really completes the look with the fox fork! Does its job and is surprisingly light. Doesn't match my kashima bits quite right. It’s the details that bring the bike together. Kashima on the seatpost, fork, top cap, and a gold XX1 chain makes a nice accent on my build. Most expensive top cap I've ever bought but it looks great on my bike. Totally worth it to add spice to your ride. Come to find out my original stem cap was made of plastic and it split in half when tightening it. Not sure why a stem cap would be made of plastic. This is a solid cap and adds character. A perfect cap to any fork that looks good on an action camera setup. Something to help your handlebars stand out on film. Nice and light. It is one color , gold. Shipping was fast like always . Good product and servise. 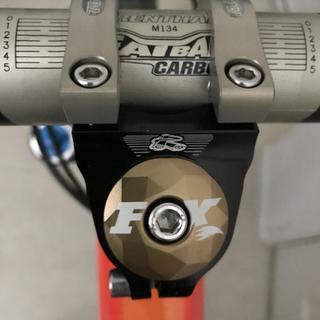 Nice addition of bling which compliments Kashima coated stanchions well... Just a bit on the pricey side for a simple aluminum top cap. Still like it though. This fox cap looks just perfect on my bike! ?!!!! BEST ANSWER: It does not include the bolt. I recommend a nice stainless on from your local hardware store. Yes, it includes the bolt and a star nut. Yes, mines came with all the hardwar. Yes is does come with the bolt. Yes. Mine included a hex bolt. Will this fit on a Cane Creek Series 40 headset? BEST ANSWER: Pretty sure it would work with CC headsets because it is universally sized to fit steering tubes of Fox or Rock Shox forks. Mine fits perfectly on a Fox 36 w/ Chris King headset combo. It's machined very nicely & looks cool!! Yes. I have the Cane Creek 40 headset on my Niner RIP 9 and installed this cap and it works and looks great.